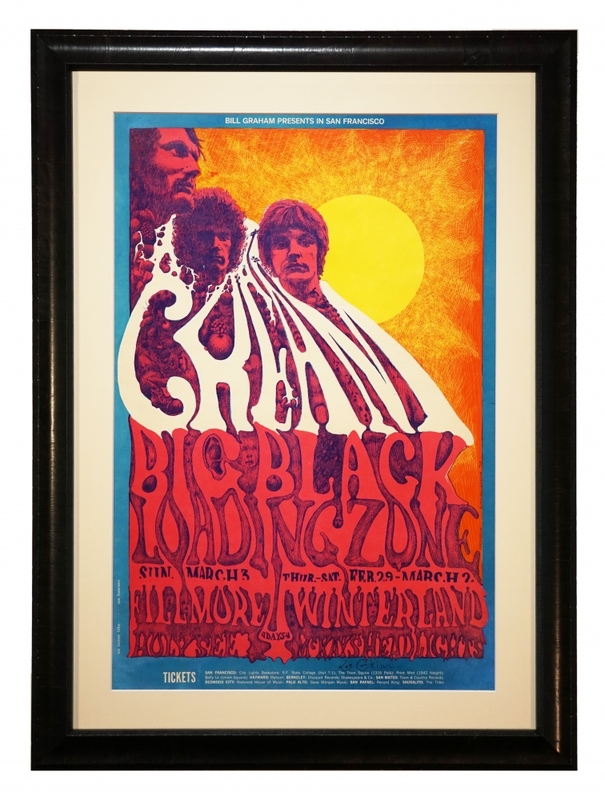 Cream, Fillmore and Winterland, San Francisco, March 1968, signed lithograph by Lee Conklin. The British Invasion Exhibition at Bahr Gallery runs from April 13 through June 9, 2019. The Bahr Gallery features posters from the late 1960's and early 70's. This Spring we are featuring posters advertising concerts in America by visiting British bands in the second British Invasion from 1968-1970. Highlights include a rare 1966 Beatles at Candlestick Park (their last concert, ever), a 1970 Elton John, several Yardbirds pieces with Jimmy Page, 1968 Moody Blues, several first edition Cream posters, 1969 and 1972 Rolling Stones, early Led Zeppelin and Pink Floyd, a 1966 Them (with Van Morrison) poster and the famous psychedelicized 4 Beatle heads by photographer Richard Avedon. The back galleries of the Bahr feature the usual wide range of both iconic and rarely seen late 1960s artwork from the San Francisco-based rock concert poster artists including Wes Wilson, Victor Moscoso, Mouse & Kelley, and Rick Griffin.